This weekend, Drew Gallagher, Foster Collins, Jack Swikart and I ventured into NEISA for the first time this season for the Hoyt Trophy at Brown. We knew we would be in for a tough weekend based on the forecast and the teams who were attending, but we were excited as we headed north. Saturday brought light and shifty breeze as A division shipped out in Brown’s new Z420s, leading to the first A race getting abandoned a little more halfway through, but as the day went on the breeze picked up but stayed shifty. Jack and I put in a few solid sets in the light conditions in A Division, and Drew and Foster put up a fight in B Division. A Division got off 6 races, in which Jack and I had some ups and downs while B Division only made it through 4 races before sunset was looming. We ended with an A set, a good dinner, and early bedtime. Sunday’s conditions proved much more exciting than Saturday’s with big breeze cycling up and down throughout the day. The day started with a B set where Drew and Foster got the hang of the Z420 in the heavier air. While the big breeze was more suited for Drew and Foster, Jack and I worked hard and tried our best to hold the boat down in the big puffs that started cranking down the course at the end of the afternoon. We sailed two sets in A Division and three in B, finishing with ten competitive races in each division In a tough fight with imperfect pairings, we all made it through the day while focusing on learning the right lessons. The team is headed to the War Memorial Regatta next weekend in hopes of qualifying for ACCs. We definitely came out of this weekend feeling tired, but we’re ready to work hard for the next week and get excited for the final stretch of our season! 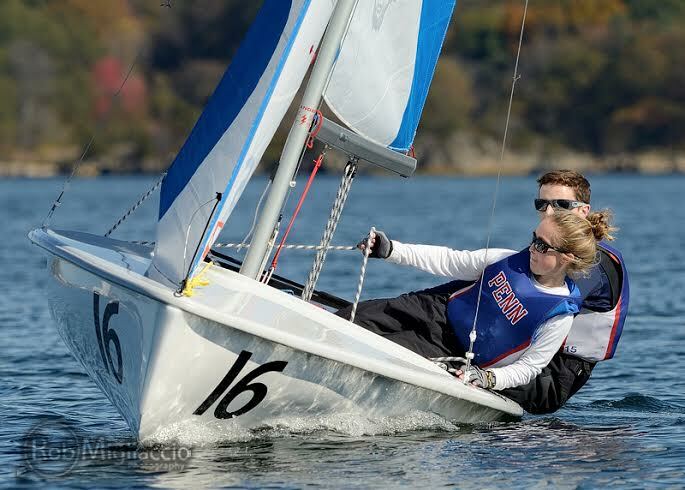 This weekend the Penn Sailing Team, composed of Jack Swikart, Drew Gallagher, Keen Butcher, Caroline Garth, Catie Hopkins, Patricia Andrade, and Cary Kane, ventured to Annapolis, MD for one of the most competitive intersectional regattas of the year – Navy Fall. 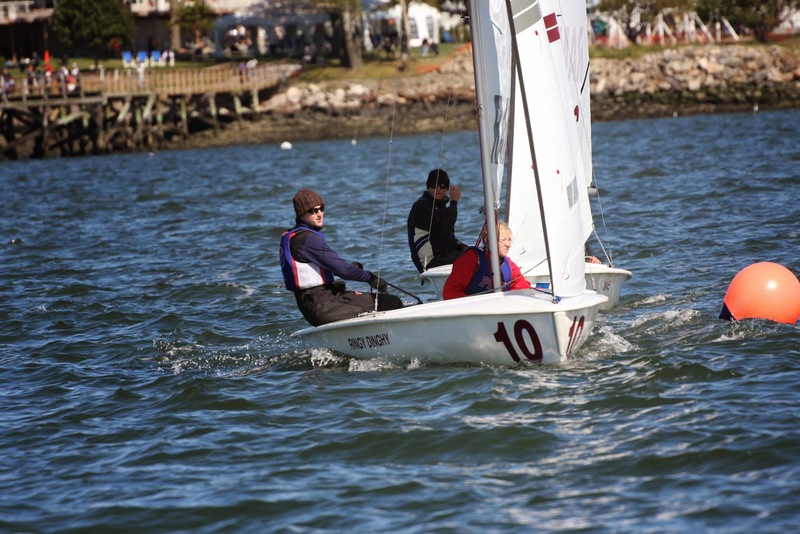 The Navy Fall is a 4-division event sailed in FJs, Z420s, Lasers, and Laser Radials, and it attracts the best college sailing teams from around the country. For the first time since 2011, Penn was able to field a team deep enough to compete in this challenging event. The first day started off with perfect conditions – 10-15 knots out of the Northwest blowing straight down the Severn River. The sun was shining and everyone was excited to compete. Jack and Catie started the event in the A-Division Z420s, while Drew and Pati started in the FJs for B Division. Keen took the helm for C Division Lasers while Caroline held down the D Division Radials. The Midshipmen of Navy ran off 8 races in each division on the day. The team had some ups and downs the first day but ultimately struggled in the challenging shifty conditions. The teams at the regatta were all ranked in the national top 25, so we were happy to have taken lessons away from the day and mixed it up with these elite college teams. Sunday came with much more breeze than Saturday, but the race committee was not deterred. They were able to complete 6 more races in each division for a total of 14. The team sailed much better on Sunday than Saturday, with over 10 top-10 scores including a bullet from Drew and Catie in the last race of B Division. We finished the event in 18th place out of 20 teams, and while it was tough to hang with the country’s top teams, we felt we learned a lot over the course of the weekend that will help us later in the season. Thanks to the Navy Midshipmen for running such a great event and to the Harding family for hosting us once again! The team hopes to take their lessons into the home stretch of the season, including the extremely competitive Hoyt Trophy at Brown and the MAISA Fleet Race Championship: the War Memorial. 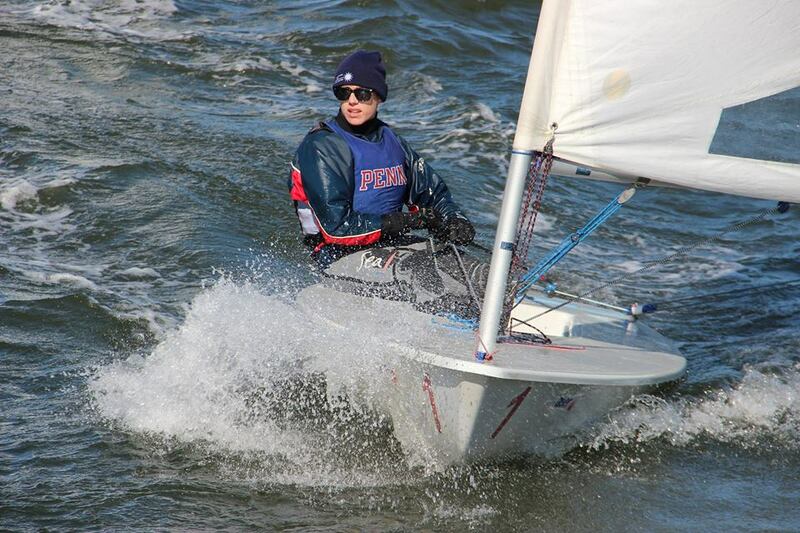 It has been an exciting fall season for Keen Butcher ’18, who has sailed in a singlehanded boat for Penn nearly every one of the last 5 weekends. 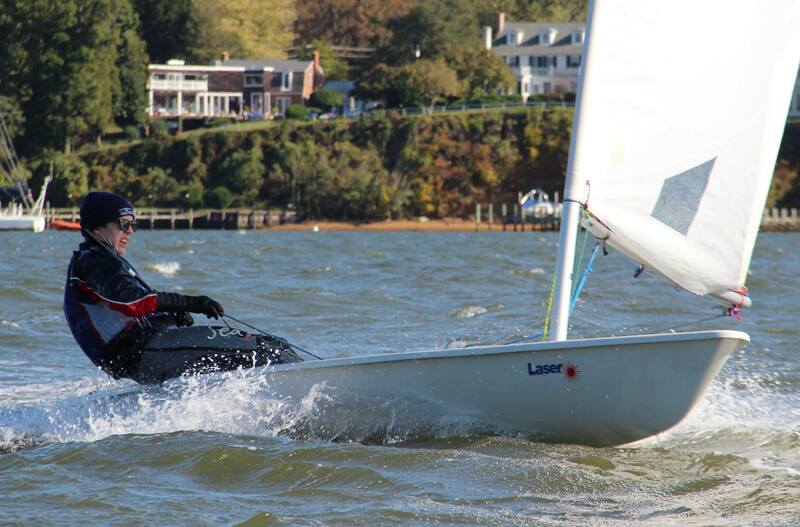 After just missing out on qualifying for the Carl Van Duyne on his first weekend at KP’s Laser North regatta, Keen was able to power through and make it into the championship via the “second chance” qualifier hosted by Navy two weeks later. Going up against the top singlehanded sailors in MAISA is no easy task – most who follow college sailing closely agree that MAISA is the toughest district in the nation for singlehanded sailing. Keen would be competing for one of four coveted Nationals berths against multiple sailors who were named All-MAISA last year, not to mention last year’s national champ from Georgetown, Greg Martinez. So on Penn’s Fall Break weekend, Keen went back to the Naval Academy once again to test his skills against the best Laser sailors in MAISA. The first day was cold and wet, while the second was cold but sunnier. The breeze was not too strong, but was enough for the Midshipmen to run the full rotation of 14 races. After all was said and done, Keen finished 12th out of the 18 boat fleet – a solid performance for the freshman from Houston, TX. While Keen’s Laser season is over, he hopes to sail some more doublehanded events in the fall and looks to return to the Van Duyne next year to try again for a shot at Singlehanded Nationals. This week, the team headed to Fordham University to compete in the Jesuit Open Intersectional. Jack Swikart, Drew Gallagher, Lucy Sergeant, Pati Andrade, and I arrived at the wonderful Gallagher family’s beautiful home and headed to bed early in preparation for what promised to be a windy day. Saturday morning dawned not just windy, but cold and rainy. Our coach, Billy Martin, met us at the Morris Yacht and Beach Club on City Island, NY and we all geared up together. Jack and I braved the freezing Long Island Sound to launch the boat from the beach. However, “boat” is a generous term for our vessel as water shot up through the centerboard trunk as we sailed. After struggling through a slow, water-logged set Jack and I returned to the dock and filed for redress (which was later granted). Meanwhile, Drew and Pati headed out as the wind built and sailed incredibly well, landing 3rd place. Unfortunately, the wind had continued to build and the race committee had to cancel the day after just one B race as almost half the fleet was in distress. Disappointed, the team returned to the Gallagher’s and settled into a relaxing afternoon including a trip to see Guardians of the Galaxy at the local theater and some much needed homework time accompanied by our favorite song “Say Something” on the piano. By Sunday the rain had stopped and the wind had dropped to 15-18. Drew and Pati suffered through the wet launch and began with one race to finish their set from Saturday. Jack and I followed with two 3rd place finishes in our first set of the day. By this time the wind was dying slowly. Drew and Pati returned to the water before Jack and Lucy went back out for what would be their final set of the day (and Lucy’s first races as a college sailor!). Drew and Pati finished the day strong with a 4th and a 1st place finish. After a desperate (an unsuccessful) attempt to get a final half set off, the race committee gave up and sent the sailors in. After sampling “the best cheesecake” in all of New York, the team pilled back into the car and headed back to campus. The weekend was incredibly fun, and though the team was disappointed not to get all the time on the water we would have liked, we enjoyed being able to relax a bit together as well. A huge thank you goes out to the Gallagher family for their incredibly kind hospitality. We would also like to thank Mrs. Swikart and Kate for coming out to support us despite the weather, and as always we would like to thank Billy for his helpful coaching advice all weekend!